This is the Thrunite Catapult V6 mini thrower , sent for my review from Thrunite and NO other compensation other than keeping the light. The Thrunite “Promotion” or sale is going on until 06-15-2018 and the discount equates to $14.00 off the listed price for the Catapult V6. 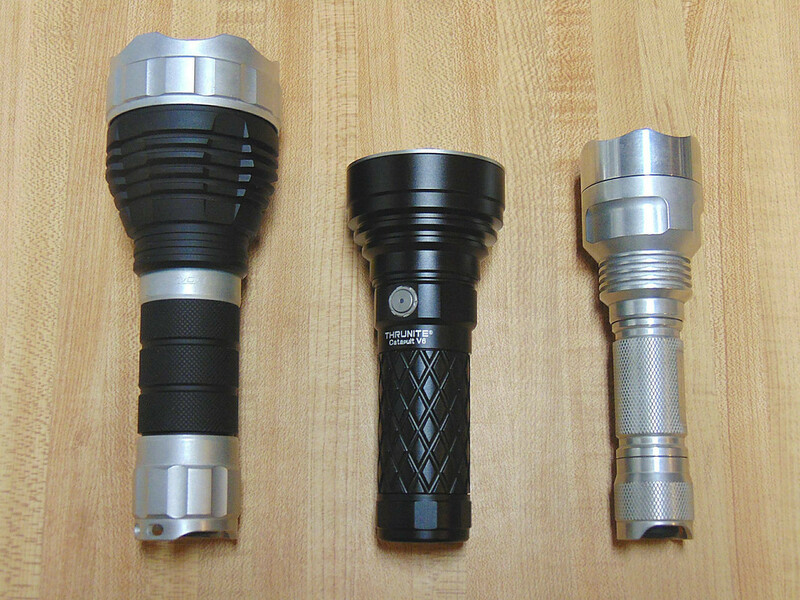 Just an FYI , also there are 5 other Thrunite lights that are using the same discount code “20%” during the promotion , here is the link to all of those as well…….. The Catapult V6 is the latest in the Thrunite lineup and it is a powerful little thrower utilizing the XHP 35 HI emitter with boost driver to get the light downrange. The light arrived in an Amazon box with large bubble wrap around the Thrunite box inside that and everything was in good condition. Everything in the Thrunite box was well packaged and well padded and it contained the Catapult V6 , a Thrunite 5000mAh cell , a nice Nylon Holster , 2 extra O-rings , charging cord , an extra rubber piece for under the switch button , an extra USB cover , a split ring (for use with lanyard if desired) the User manual and thank you card. Upon unpacking the V6 the first thing I noticed is how well the light feels in hand and of course the Thrunite quality that seems to be present every time I grab a new light from them. The holster that comes with the package is also a pretty nice nylon holster and fits the light very well. The large diamond knurling to me looks great on the light and although it does not have the traditional Thrunite knurling we are used to seeing (and feeling) , it is still a good feeling knurling providing plenty of grip to prevent slippage. The knurling is also very well machined and no bad spots or ragged edges that I can find. All the Anodizing is very consistent and no thin or bare spots anywhere on the light. The Catapult V6 is just a little larger than a C8 in diameter (although slightly shorter than a C8) and just a little smaller than the Convoy L2 with single cell tube. The Bezel is styled in the traditional Thrunite style and it sits flush at the front of the light. The lens is AR coated and was crystal clear when I unpacked the light. The reflector is also very well done , very smooth and NO pin prick spots , dings or anything of that nature that I can detect. The XHP 35 HI is perfectly centered in the reflector with the large centering piece used. The side switch button is a metallic one and sits nicely in the flat of the housing. The center of the switch is lighted and serves several functions , with those being a power indicator , when the light is on (other than Moon Mode) , a Low Voltage warning , and charge indicator , showing Red while charging and Blue when fully charged. The indicator will turn purple if something is wrong such as the cell inserted backwards , or some other malfunction when trying to charge. The charge amperage is listed at 2 amps with the built in USB charger. All of the threads are machined well and are smooth to operate. (tighten or loosen) The threads were lightly lubed when I received the light. The light will tailstand well as the tailcap is made very flat and there is NO switch there. There is also double springs in the tailcap , so the current should have less resistance than a single spring tailcap. A single hole for the lanyard , or use of the spilt ring to attach the lanyard on the tailcap. The MCPCB is odd to me , as it is made square and sitting on the round shelf inside the head. Although it is odd , it does seem to do what it needs to do and moves enough heat out to the head and fins to keep the light from getting overly hot. I took temperature readings through the first part of my run time testing and at the hottest point , I never found a spot over 123 degrees Fahrenheit , or 50.5 degrees Celsius on the light anywhere. The readings were done indoors , with the ambient temperature at 79 degrees Fahrenheit and NO airflow on the light. The UI on the Catapult V6 is fairly easy to remember and use. To go into Firefly or Moon mode it is a simple press and hold of the switch. From there you can either do a quick click back to off , or you can do a slightly longer press (1/2 to 3/4 of a second) and go into the regular modes , without turning the light back off. To advance to the next mode of Low / Medium / High it is again a 1/2 to 3/4 press of the switch and release when the next mode is advanced , or hold the button down to scroll through L / M /H. From any mode (including OFF) a quick double click of the switch takes the light to Turbo mode and from Turbo you can access the “Strobe” function with another quick double click of the switch. A single quick click turns the light off. The beam is pretty tight or defined , for the head to be as small as it is and using the XHP 35 Hi. I was surprised just how well focused and defined the beam is on the Catapult V6 to be honest , as I just was not expecting it to have the beam it does. The edges at 22 feet are well defined and the hotspot itself is pretty intense. Out at 400 plus yards , it still maintains a fairly tight hotspot for the small reflector and head , and puts a good amount of light on target at the 400 yard mark. Although the beam is well defined and all , the light does maintain enough spill for walking or what have you outdoors and is not simply a narrow pencil beam. 100 Yards from gate in Medium / High / Turbo………. And at 400 yards from far white marker and treeline , and then the center , or hotspot from that same picture enlarged…………..
Also I was asked about posting the still photos of the light along with all the GIF animations (in another thread). Since I already have a ton to do to get these reviews posted here in BLF and also on TFF , as well as Youtube and my dedicated Facebook review page , it would not only take alot more time , but with 36 individual pictures would take alot of space here as well , as well as adding alot of time to post each one of those links separately. Soooooooo what I did decide to do is , I uploaded the pictures to the hosting site and if you would like to see a particular picture that is in the GIF images , to get a better look at it , then here is the link to all the stills on the hosting site….. 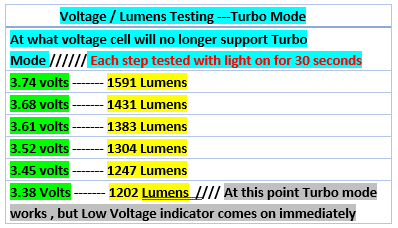 In my testing on the lumens , the sample light I got for review started out pretty close to the listed specs in lower modes, but as I increased the modes higher , my readings got consistently higher than what is listed for this light , up to 330 lumens more in Turbo mode. I double checked my light box and my DMM both , with a couple of other lights that I know the readings on already and that I am sure are right , those were consistent with previous numbers on them , so the numbers posted in the charts below ARE correct for the particular sample I received of the Catapult V6 and I do not expect these numbers to be “written in stone” for all of the other Catapult V6 lights. The V6 DOES have a Turbo timer at 3 minutes and steps down at that time to the High mode. I am not sure if I would call it a step down , or simply a voltage drop after that , but at 8 minutes my sample of the V6 dropped to 867 lumens. The light then ran the rest of the time through the test in that mode , or state. 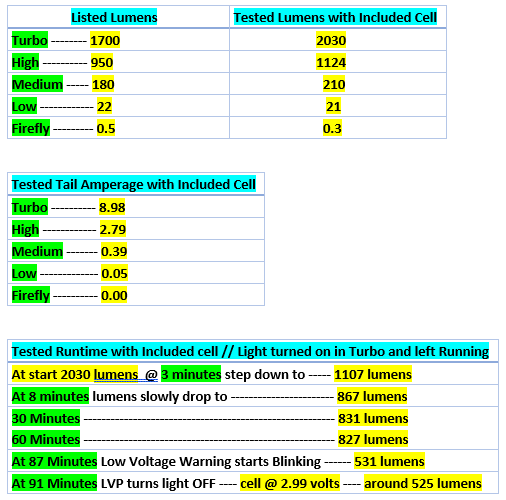 All of the runtime testing and lumens are listed in the chart I made for the testing below. Overall I think the Catapult V6 is a well built little thrower , with alot of punch and serves its purpose well. The ONLY thing I would suggest changing would be to make the bezel slightly Crenulated so that if it did get set down flat on the bezel with the light turned on , you could see a little light coming out , as it may make a burn sitting head down on something. Personally (and just my opinion) I feel it may look a little better too. Other than that I LIKE IT !!!!! For those that may want to see the comparison of the Catapult V6 with the (Very Modded) Convoy L2 and the (stock) Acebeam L16 in the live outdoor footage ……. that segment starts at 15:00 of the video timeline. Video followed by listed specs and info……………. •LED: CREE XHP35 HI LED with a lifespan of 20+ years of run time. •Peak beam intensity: 140650 cd. •Working temperature: -20℃ to 40℃. Nice review thanks. Still seems very bright at 400 yards judging from your photos. I think you are totally on point about the bezel. While it is always nice to be able to tell if the light was accidentally left on, on something so powerful, a slightly crenelated bezel isn;t just a convenient feature, it is a necessity. Especially so, if you live with people who don’t fully appreciate what a modern light is capable of. My pictures may not be 100% accurate , as I try to take them and make sure they are as close to what I am seeing with my eyes as possible but………..There is actually a lot of light down there and I can see the marker and trees plainly with my eyes when shining the light at them. I have also watched deer walk across the field out there right at that same tree line and can see them plain enough to know exactly what they are. EDIT: that white sand out there also gives a lot of reflection up closer so when the watermelons and corn get to covering the ground good I will try to remember to get a comparison photo at that time from the same spot. Yea I have burned my desktop a couple of times just getting amperage readings with 2 of the high powered lights. They can and do put out enough heat to start a fire with some of the high output lights.. This is the performance of the massive Olight SR90 from the year 2011, but with a single 26650 battery, and maybe more throw. It’s also shorter than the C8. Wow! This reinforces my belief that the “flashlights” they would be using in the movie “Alien: Covenant” set 90 years from now will light up the entire cavern with 100,000 lumens like pocket lights, and not an Ultrafire knock-off. Thank you for the terrific review! Amazing! Great review! I’ve been extremely happy with mine. Thrunite rocks! Thanks the4ds9 and atbglenn……..always glad to do the reviews and yea I am liking the little beast so far myself. All good points depending on what the user is looking for though. The Bezel we agree on for sure , however I personally rarely ever charge a cell inside a light. That is also just a personal preference of mine. As far as rolling , that is also dependent on where you lay the light or if you even lay it down , it does tail stand well , so as long as there is a decent surface you should be ok to do that. I wouldn’t think it would be used for much close up work , seeing how it is a thrower by design though. You are right, all personal preference I suppose. Thanks for the great review! My phone is USB-C, but that has nothing to do with how I feel about my USB Mini flashlights. I have plenty of charging cables that do both. Yeah, it would be nice to have USB-C on everything, but is not the reality yet. Hopefully, it will be soon. As always I am glad to do the reviews. Also as mentioned in another post of mine recently , I do these not only because I like doing them and it gives me something to look forward to doing……….. But I do the reviews to help others see some of the features of the lights instead of just going on what is listed on the websites with the many times exaggerated photos and blown up specs. Once the review is done my part is done other than maybe answering any question I can. The information , pictures , video and testing I do is basically to help others draw their own conclusion if they like the product or if they don’t. We cant make everybody happy.. i am happy with my thrunite catapult v6.. $20-$25 cheaper than manker u22… thrunite spent alot of time and effort on the reflector.. this one came out great.. watch catapult v6 reviews on the youtube.. amazing small thrower light ! They really are great throwers for the size. In my video in the OP at 15:00 of the timeline (or my youtube video) I do the outdoor footage comparing a highly modded Convoy L2 and the Acebeam L16 with the Catapult. The website shows them to be available for US , Canada and Japan. Thank you ........... My pictures may not be 100% accurate , as I try to take them and make sure they are as close to what I am seeing with my eyes as possible but...........There is actually a lot of light down there and I can see the marker and trees plainly with my eyes when shining the light at them. I have also watched deer walk across the field out there right at that same tree line and can see them plain enough to know exactly what they are. EDIT: that white sand out there also gives a lot of reflection up closer so when the watermelons and corn get to covering the ground good I will try to remember to get a comparison photo at that time from the same spot. Your pics are good as I have a tree around 400 yards away and the V6 lights it up strongly. I was really surprised and purchased another V6 after that. One thing I like about the USB port is that it allows the battery to vent if there is a battery problem instead of pressurizing the battery tube. I know this because every time I put the battery in the charging port flap pops open. Ignore that last post……….it seems they list the V6 in NW on the site , but in fact it is only available in cool white. Thank you ……….. My pictures may not be 100% accurate , as I try to take them and make sure they are as close to what I am seeing with my eyes as possible but………..There is actually a lot of light down there and I can see the marker and trees plainly with my eyes when shining the light at them. I have also watched deer walk across the field out there right at that same tree line and can see them plain enough to know exactly what they are. EDIT: that white sand out there also gives a lot of reflection up closer so when the watermelons and corn get to covering the ground good I will try to remember to get a comparison photo at that time from the same spot. Your pics are good as I have a tree around 400 yards away and the V6 lights it up strongly. I was really surprised and purchased another V6 after that. One thing I like about the USB port is that it allows to battery to vent if there is a battery problem instead of pressurizing the battery tube. I know this because every time I put the battery in the charging port flap pops open. I got to studying the pictures on my computer screen and then went out and shined the light at that same spot again (from the tripod) , using binoculars to see the treeline and marker. The reflection up closer does make the light look brighter up close in the photo with the white sand , but at the treeline , in the picture that I enlarged , it is actually fairly close from what I can tell with the binoculars and standing right where I had the camera sitting to take the photo. I guess what I am saying is , the picture is a little deceiving as far as the up close spill in the 400 yard shot because of reflection off the sand , but at the same time the light on target is represented fairly close to what I see in the enlarged photo at 400 yards. From your pics, it's easy to see the reflection off the sand and doesn't take away from the actual brightness of the trees at 400 yards. I knew right away when I saw your pic it was very close to what I am seeing with my V6 at that distance. The V6 is a keeper, that's all I can say! This could be my first Trunite flashlight, if I can somewhere to buy it that ships to Denmark without breaking the bank. I don’t know where to even start looking to find this light to have it shipped to you there , unless maybe Amazon will ship it there? Wow I didn’t know shipping was that expensive to get things there. Hopefully HKE will get a few in stock soon. I know what ya mean about don’t “NEED” another flashlight……..I am at 140 now I think , or pretty close , but never have too many…..
At least that’s my theory , wife has different thoughts at times I do believe. Have you tried Amazon.de yet? A marketplace seller „HoPE GmbH“ sells it for € 79,95 plus shipping. I don‘t know if they would ship to Denmark but maybe it’s worth a try. I only have the 65 flashlights I use most out in the open, and three big boxes of flashlights I do not like/use. Thanks for the suggestion, shipping to Denmark is € 16,80.
it seems they list the V6 in NW on the site , but in fact it is only available in cool white. Correct. Not available in NW. I had an order in for one and a few weeks later they told me it wasn’t going to be produced and refunded the money. Did you check how high the voltage need for activating turbo mode? No I didn’t even think about that to be honest. I did the run time test listed in the charts in OP , starting in Turbo and just let the light run from there until it shut down.